Professional and Discreet Suicide Cleanup Ventura. We’re here for you in your time of need 24-hours a day. Call us at (877) 800-8110. There is nothing more devastating than the sudden and unexpected loss of a friend or family member – especially to suicide. The coroner, fire departments, paramedics, and police have left you with the gruesome and devastating aftermath. Don’t further the trauma by attempting the suicide cleanup on your own. Cendeocn specializes in suicide cleanup and we are licensed and insured. Suicide scenes are traumatic enough and we are here to help you and your family in your time of need. As sad as these circumstances are there is, unfortunately, the need for professionals who are qualified to take care of the aftermath of these terrible occurrences. Cendecon specializes in Discreet Suicide Cleanup Ventura. There are health risks associated with human blood that can live outside the body for a considerable length of time. Hepatitis is the best case. Suicide cleanup involves special training, certification, licenses, and experience and thus should be performed by a company that specializes in it. Our suicide cleanup team has handled thousands of crime scene cleanups at scenes including suicides, injury, and demise. We will ensure that your needs are met and the scene and that the property is decontaminated and safe for others to occupy. We know after a suicide, relatives are at a misfortune and are overwhelmed with everything that needs to be done. We will do everything in our power to take as much of burden off you as possible, the initial step is to call us. We will arrange to have the suicide cleanup performed immediately and we will provide referrals to crisis advisors, Pastors and any other needs such as legitimate funeral homes. You don’t need to tackle this alone. 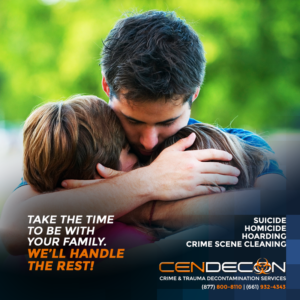 The staff at Cendecon will help you through the procedure and take care of the suicide cleanup. We have live help 24 hours daily to help you. We are the most trusted in our industry and we specialize in ever aspect of Crime Scene Cleanup including Suicide Cleanup. Our crews are compassionate, discreet and empathetic. We are accessible 24-hours per day and we are here to #help. We’re the ones that people turn to in their darkest hour. Shockingly, suicide cleanup isn’t taken care of by the coroner, EMT or some other government official. Once the body is removed the rest is abandoned. Most don’t know who to turn to, they progress toward becoming overwhelmed and can wind up discouraged and pondering tackling the suicide cleanup alone. Our strategy is to help wherever we can with to allow you to take care of all the other arrangements. Often time suicides result in a lot of blood and body fluids and we are prepared to deal with any suicide cleanup work. We will work with your insurance company to limit out of pocket costs. Call us at (877) 800-8110. 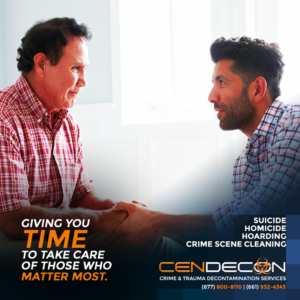 Cendecon is experienced, insured, and licensed to provide Suicide Cleanup in California. We have helped numerous families after the suicide of a friend or family member and I can genuinely say I hope you never end up in a circumstance where you require our services, but in the devastating occasion that you do require us we are here for you and we are only a phone call away. We will deal with the cleanup as fast, cautiously and professionally as possible. Our vehicles are unmarked and our crews won’t address any neighbors or media unless you particularly ask us to. We will come out and assess the extent of work and give you a free estimate. As mentioned we work directly the insurance company to minimize your out of pocket expenses. We’re here for you 24-hours a day at (877) 800-8110.